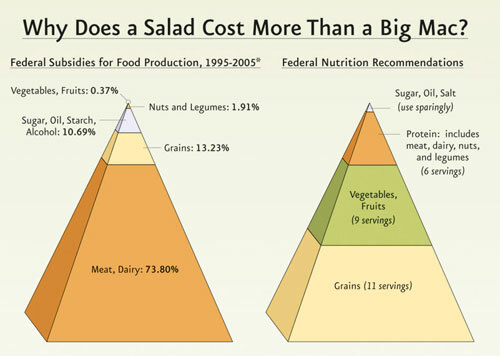 Ever wonder why healthy foods, like fresh fruits and vegetables, cost so much more than the unhealthy foods, even though the junk has so many more ingredients, goes through loads of processing, and just generally involves much more labor and resources? The answer, by and large, is government subsidies. President Franklin D. Roosevelt introduced government farm subsidies in the 1930s. Nearly 80 years after their enactment, farm subsidy programs remain in place with government payments for them now approaching $25 billion annually. The "Farm Bill" that appropriates these food subsidies, is being voted on again in 2012, and we should look at this time as an opportunity to begin setting things right. If you don't support the idea of your tax dollars lining the pockets of wealthy corporations who flood the market with processed garbage and other junk food, now is the time to speak up. Misleadingly referred to as the "Farm Bill," this legislation doesn't benefit the local or family farmers who grow the vegetables you see at the farmers market. The beneficiaries of agricultural subsidies set forth in this legislation are the corporations like Monsanto that convert crops like corn into corn syrup and soy into feed for the cows and pigs who end up on in the fast food wrapper. The result is an artificially controlled market that floods grocery stores and eateries with foods high in saturated fat, cholesterol and high fructose corn syrup. These are exactly the types of food we should be avoiding if we want to stay healthy. By reducing federal subsidies that boost the production of meat, dairy and high fructose corn syrup, and leveling the playing field for fruit and vegetable farmers, more Americans will be able to buy the wholesome foods they need to stay healthy. Maybe then, more people will choose to live on a much healthier vegan diet.